At Kinsta each of your sites can have a staging environment. Staging environments are first copied from your live site, and then allow you to test plugin or code modifications without affecting the live site. Kinsta offers the option to push your staging environment to your live environment which is useful if you are happy with the changes you’ve made and you want them to be applied to your live site. This is a simple one-click affair but please read the notices below before proceeding, they contain essential information about the process. It is important to note that the staging environment will completely overwrite your live site. Environments contain all the website’s files and the database. The staging websites files and the database will overwrite the live site’s files and database. We recommend using the push to live functionality with care, initiating it during low traffic times and having a developer handy just in case. We create a backup automatically for you so a push to live event can be rolled back as needed. Once the process has completed please clear your browser’s cache and purge your Cloudflare cache if you use their service. Then load the website and ensure it works as expected. Your staging environment is kept in-tact so you can continue to develop changes in it without affecting your live site. Your staging URL will automatically be replaced with your site’s primary domain. If you have hard-coded links in your code that should only be used in the staging environment make sure to change them as appropriate. Before initiating the process please double-check your wp-config.php file for any errors. The staging environment should be used for development and testing only. They are not designed to be used as live production sites and there will be things that don’t function correctly. Kinsta is not responsible if you try to use staging for a live site. 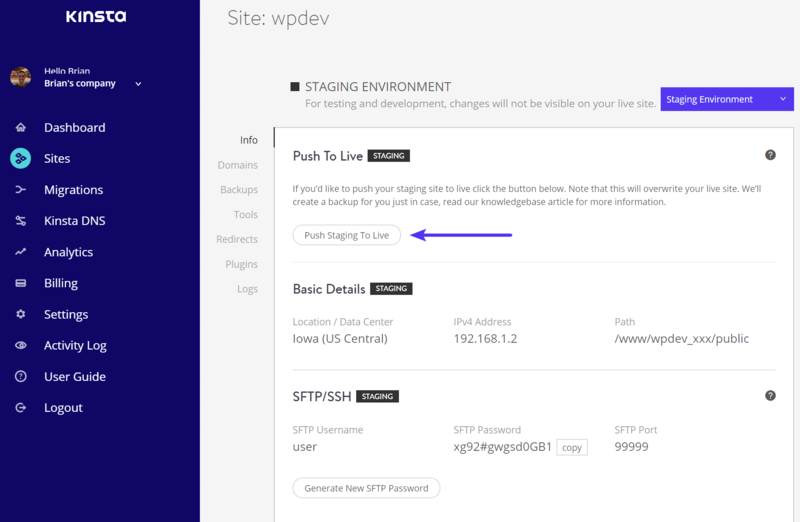 If you previously had the Kinsta CDN running on your live site there is no need to re-enable it once you push your site from staging to live. The CDN won’t break during this process as everything is automatically rewritten on the backend. 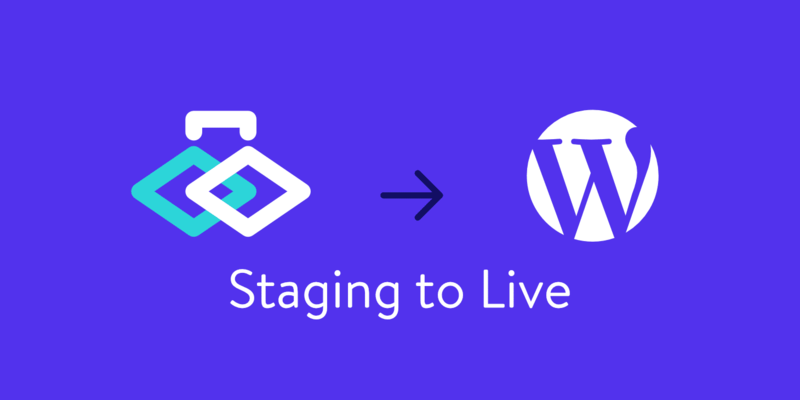 Follow the steps below to push your WordPress staging site to live. Log in to your MyKinsta dashboard and select the site in question. Use the environment selector in the top right of the header to select your staging environment. Once selected click the “Push staging to live” button. Read the information displayed in the resulting popup. Type your site’s name in the field, then click on the Push To Live button. Note that the time required for the process to complete depends on the size of your website. The Kinsta admin will notify you when the process has completed. Your website will experience a couple of seconds of downtime at the final stages of the process. → How Do I Use the One-Click WordPress Staging Environment?